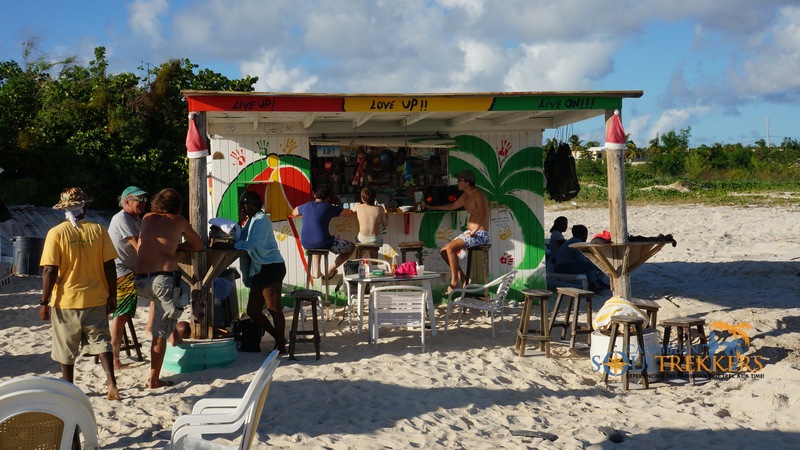 Home / Bars / Trek Stop: Garvey’s Sunshine Shack in Anguilla – Soak in the Sun and the Fun at a True Caribbean Beach Bar! It’s no surprise that Mango Eddie and Garvey quickly hit it off. 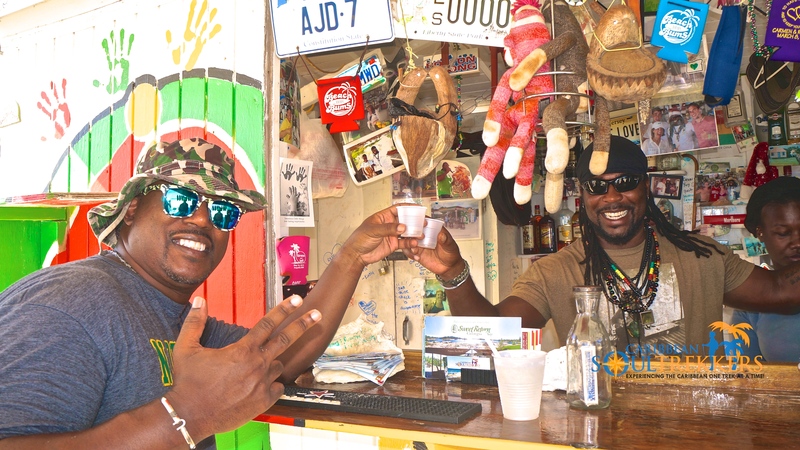 Here they are enjoying a welcome high proof rum. 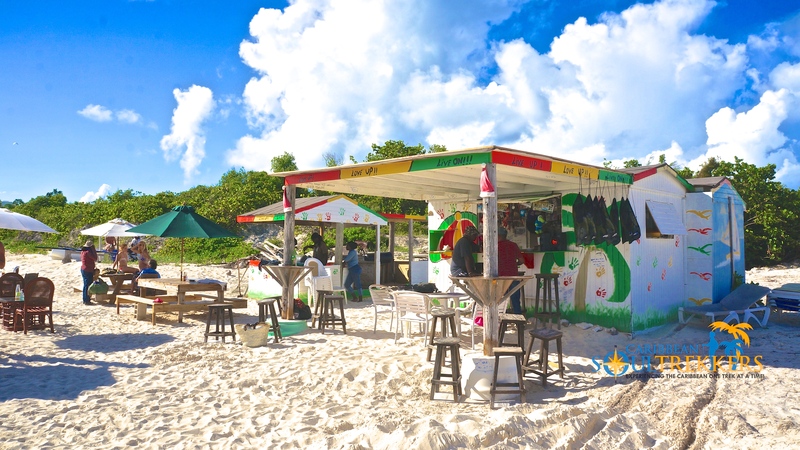 In a clearing on Anguilla’s gorgeous Rendezvous Bay between the CuisinArt Resort and Anguilla Guest House lies Garvey’s Sunshine Shack – a true Caribbean beach bar where old and new friends from around the island will eventually end up to have an especially good time. 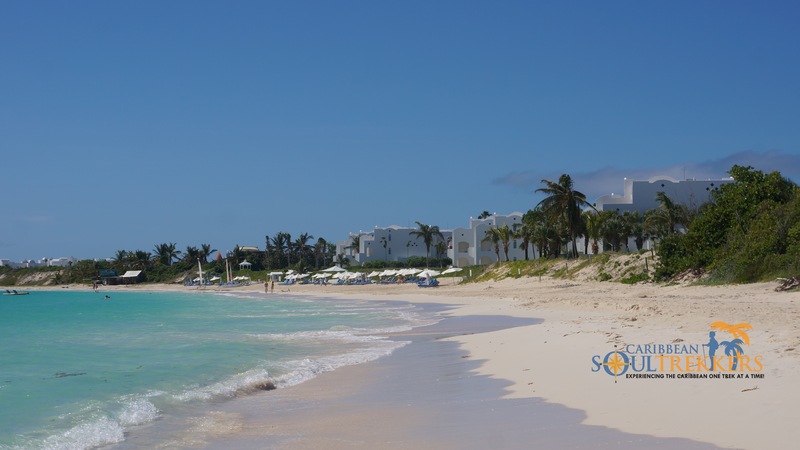 When visiting Anguilla, this is definitely a place where you should end up too! Read our review of Garvey’s Sunshine Shack to see why. 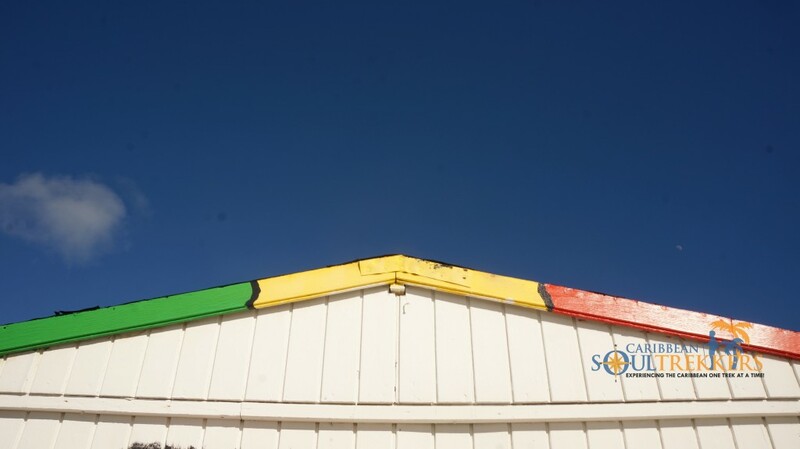 Garvey’s Sunshine Shack is a brightly colored, wooden beach bar strewn with guest photos and souvenirs. 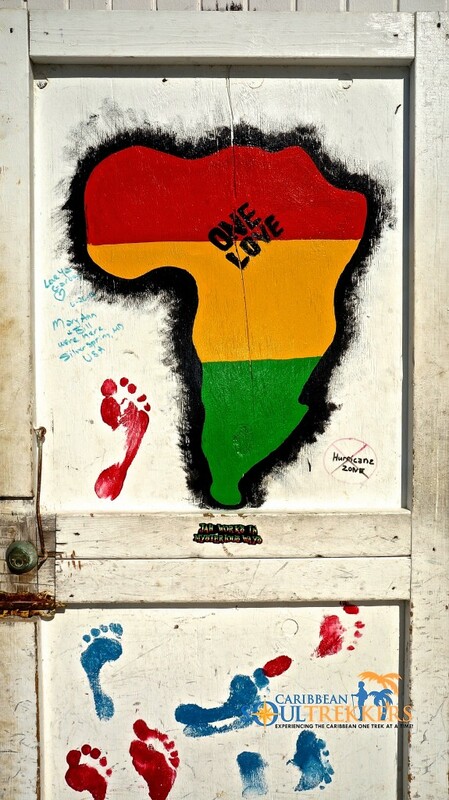 Everything about it says “WELCOME!”. It is a place where upbeat, Caribbean music pipes from the radio; where guests sip cold drinks while gazing at an incredible view of neighboring St. Martin or casually mingle between picnic tables spread out in the sand; where smoke billows from a traditional, roasting pit; where the vibe is laid back and fun-loving; and, on special occasions, where the owner strums his guitar and serenades his guests with a lovely song or two. 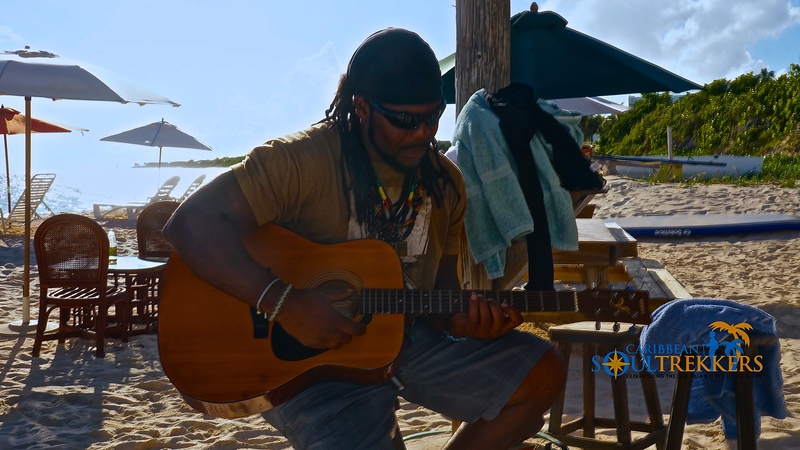 Garvey treating the Caribbean Soul Trekkers to an impromptu song. 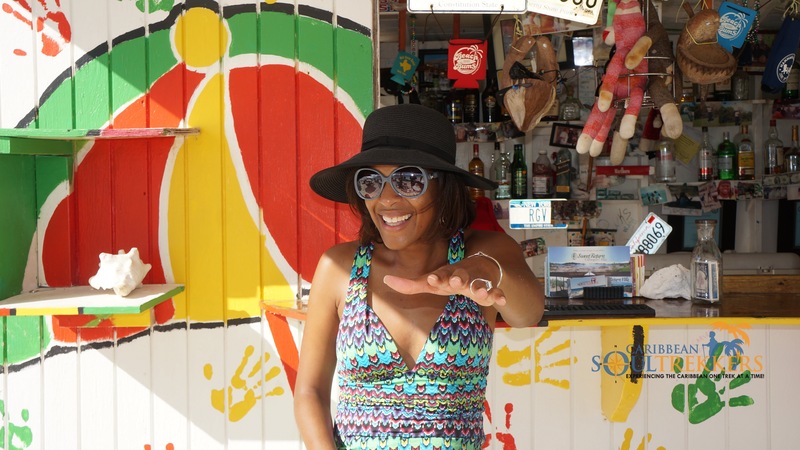 The Sunshine Shack’s owner, Garvey, is a charismatic host who effortlessly offers a wide grin, a hearty laugh and genuine Caribbean hospitality. He and his staff welcome their steady flow of guests as though they are old friends just back from a long journey. 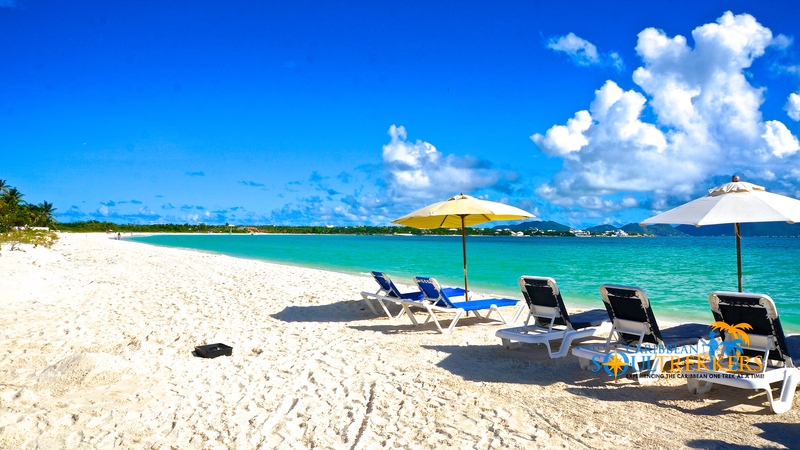 “Hello!” is immediately followed by a genuine, “What can I get for you, my friend?”, “Care for a lounge chair on the beach?” and “Would you like to use the snorkel gear?” And in case you were wondering, the correct answers are “Mango Eddie’s Passion and a plate of roasted snapper”, “Yes; I most certainly would” and “Don’t mind if I do”. 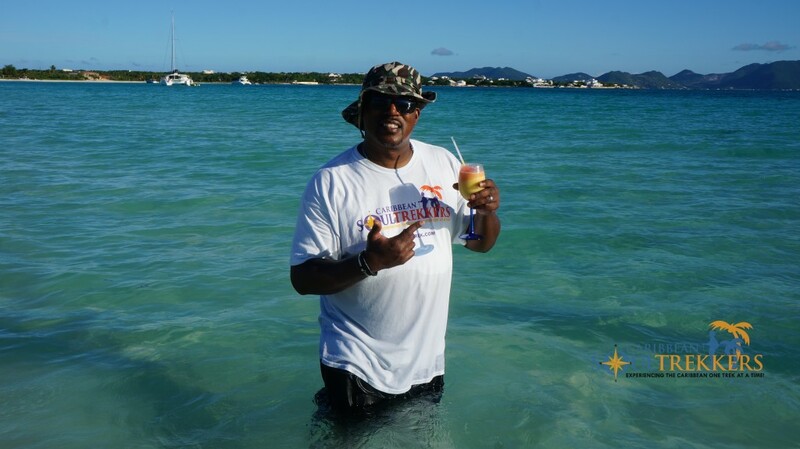 Like perfect Caribbean hosts, Garvey and his crew constantly keep a constant eye out for guests who need their drinks replenished. 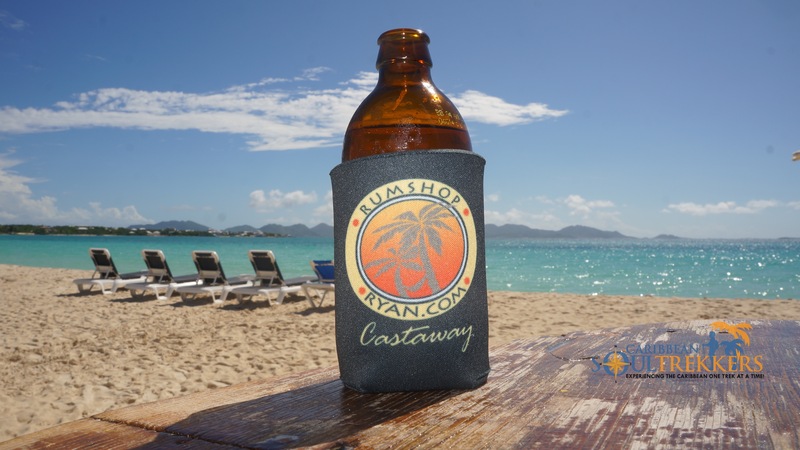 Along with ice cold beers from a cooler, Sunshine Shack’s drink menu includes Garvey’s BBC’s (Banana Bailey’s Colada), Pineapple Margaritas and Rum Punch. And since our visit, a new signature cocktail, Mango Eddie’s Passion, is also available by special request. 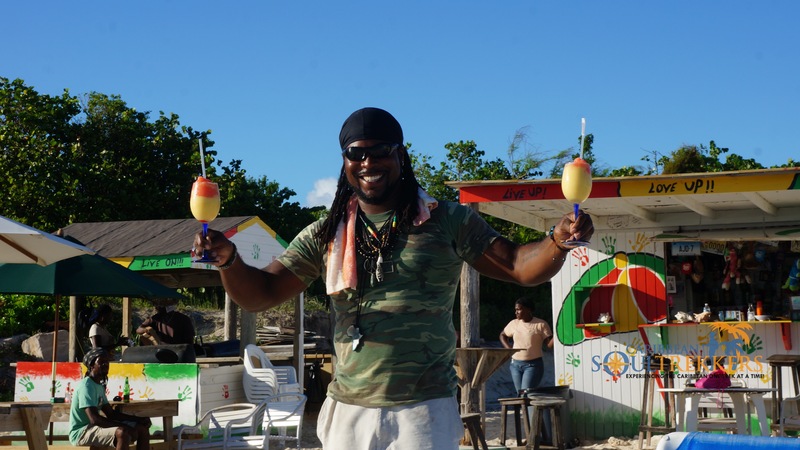 It’s a sweet and tangy blend of light rum, mango, passionfruit and ice perfect for sipping on this sun-kissed beach. 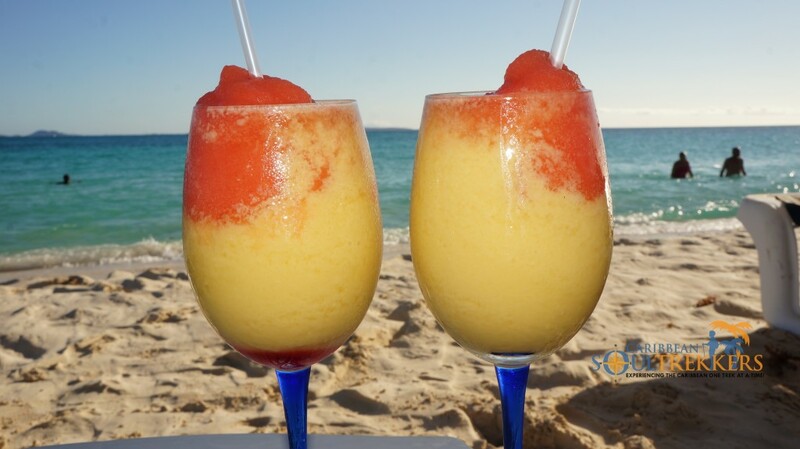 Mango Eddie’s Passion – a refreshing, sweet and sour blend of light rum, mango, passion fruit and ice. Mango Eddy enjoying his first speciality cocktail from the best seat at Garvey’s! 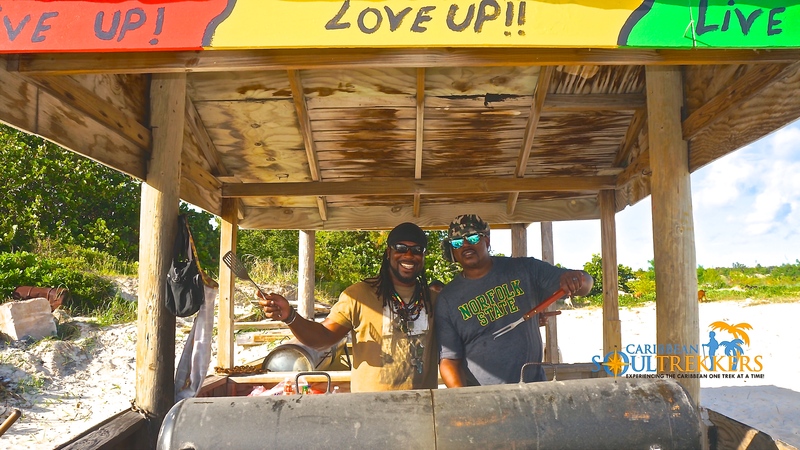 The gang at Garvey’s Sunshine Shack takes pride in the food they serve – chicken, ribs or snapper, slow roasted over hot coals in a pouch of aluminum foil sealed tightly to retain juiciness and allow those Caribbean spices to mingle. The finished product is just what Garvey promised: “tender, tender, tender” and so very delicious. 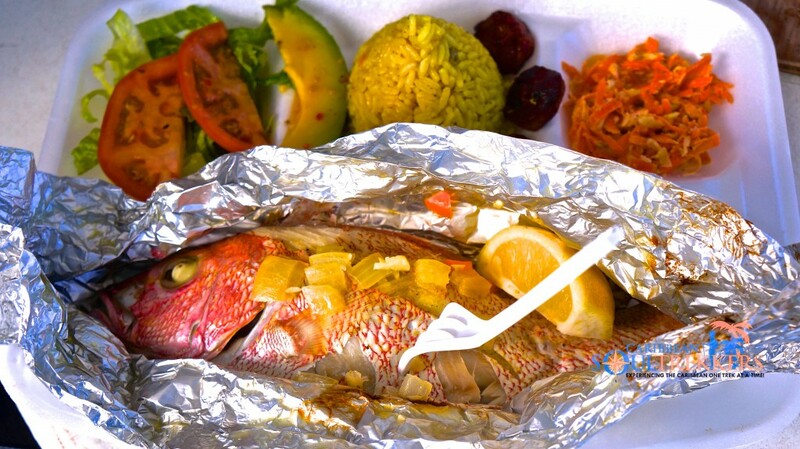 Well worth the wait – a plate of perfectly steamed snapper with Caribbean sides. Yum! 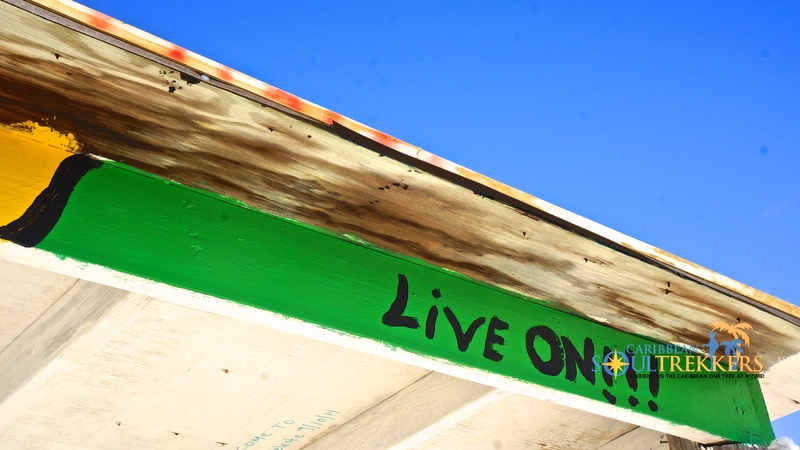 Garvey calls his place “Just a little shack with nothing to do but not enough time to do everything”. We couldn’t agree more. 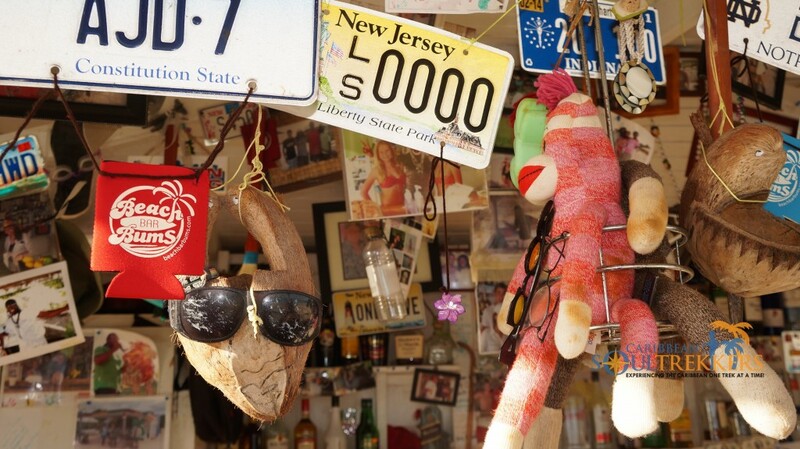 An afternoon spent eating, drinking, swimming, snorkeling and kickin’ back at this great place passed much too quickly. 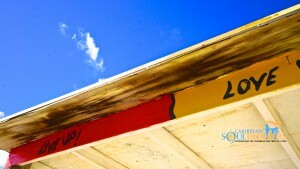 Good thing we had the next day to do it all over again! 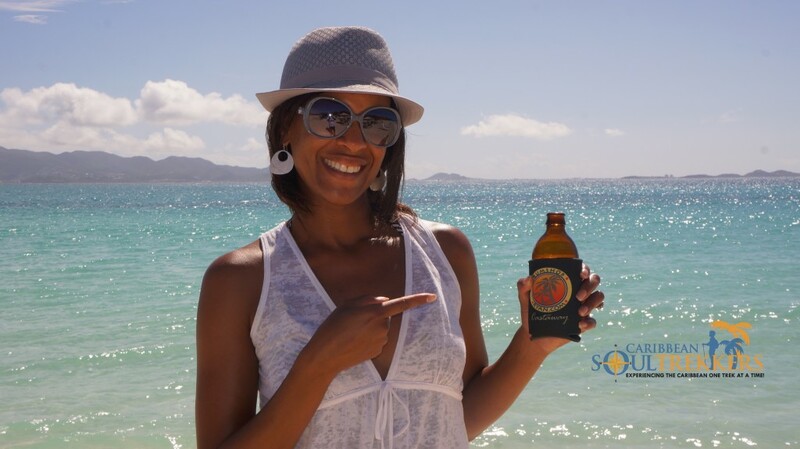 Blatant advertisement for our new, speciality cocktail at Garvey’s Sunshine Shack! 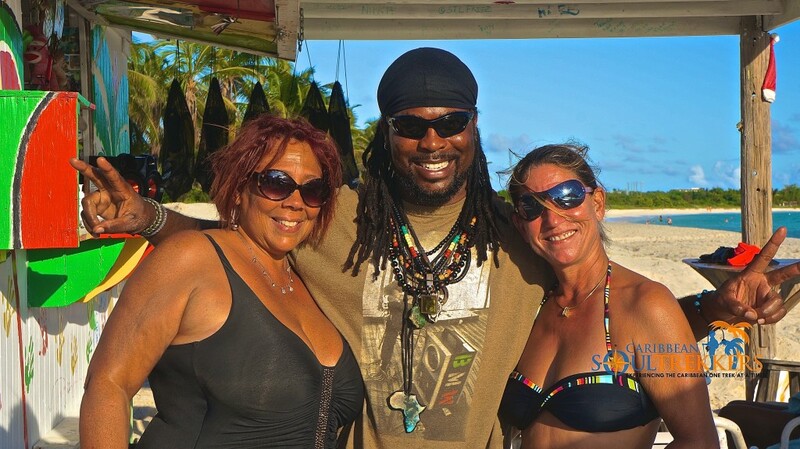 Caribbean Soul Trekkers is so grateful for the VIP treatment we received from Garvey and his crew. Great conversation, a prime spot to sign our name, a personalized song and a signature cocktail were too good to be true and made this one of our most memorable trek stops yet! 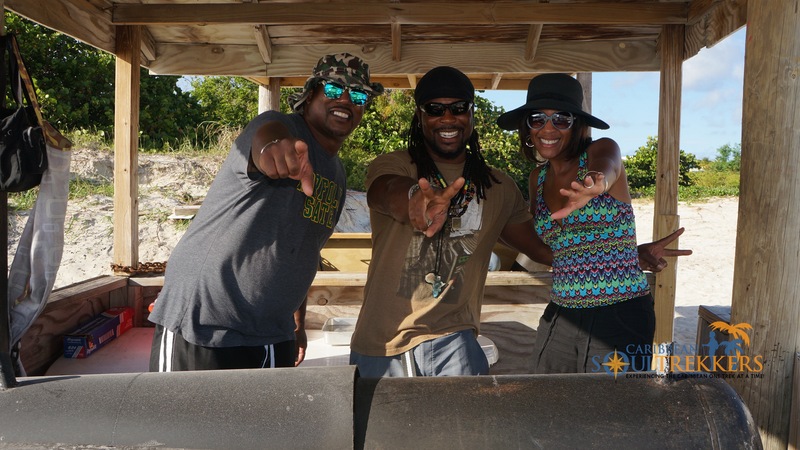 Caribbean Soul Trekkers getting’ it in at Garvey’s Sunshine Shack! Mango Eddie – lefty guitar player just like Prince! 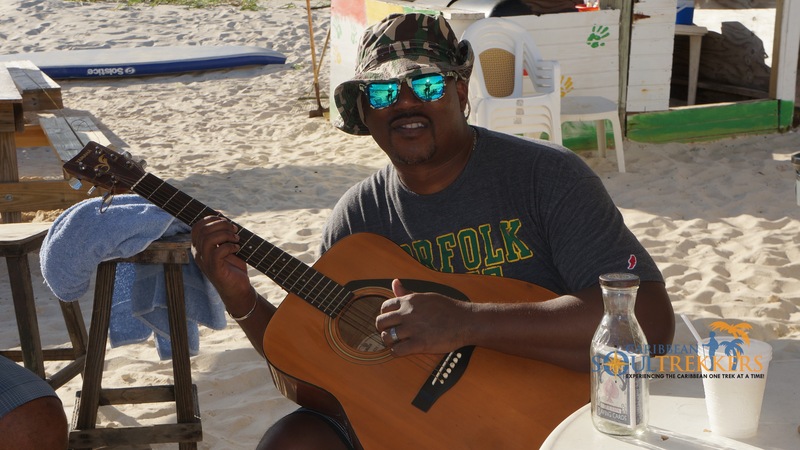 If you want to trek to Garvey’s Sunshine Shack on Rendezvous Bay, we recommend that you park at Anguilla Great House, head straight to the beach and make a right. 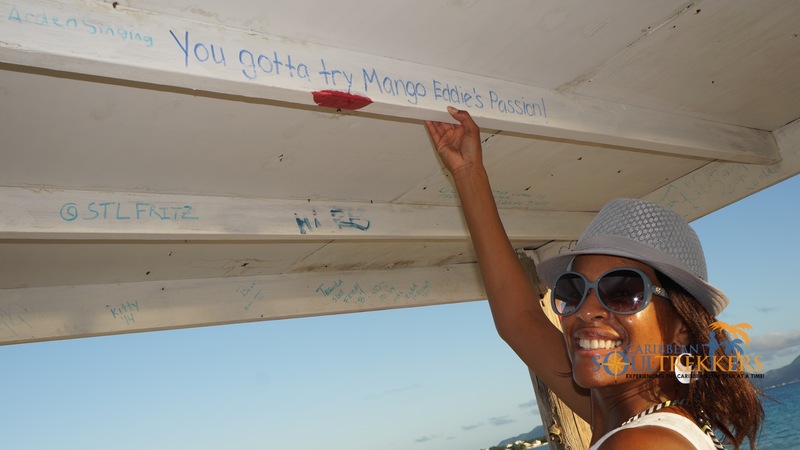 And don’t forget to tell them Caribbean Soul Trekkers sent you!